Crianlarich (A’Chrion Laraich) is a small village in the west Central Highlands with a strategic location. Located at the junction between Strath Fillan, Glen Falloch and Glen Dochart its geography has made it a passing point for people and trade between east and west and the south from the earliest times. Curiously it has never become a significant village or small market town; indeed its name, translated from the Gaelic implies that it was a poor and insignificant place. Even the coming of the Railways in the 19th century did not have as much impact on its development as might have been expected. 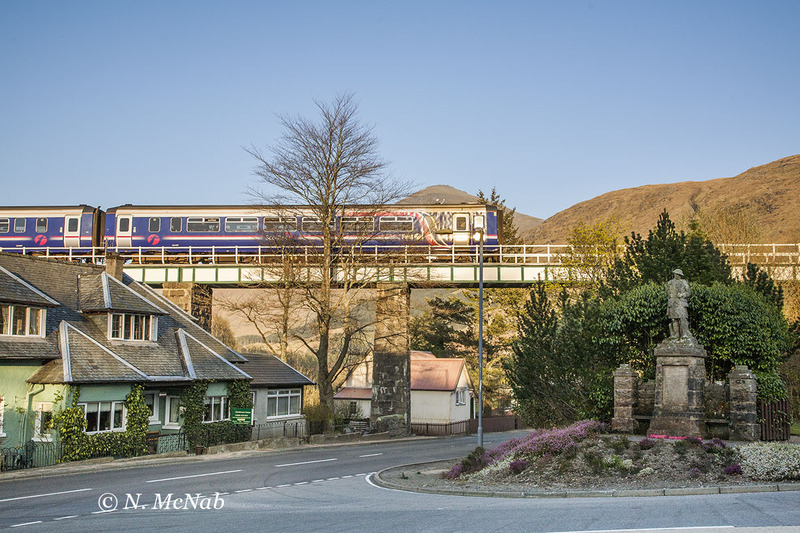 Fort William/Mallaig train crossing A85(Perth-Oban), Crianlarich. 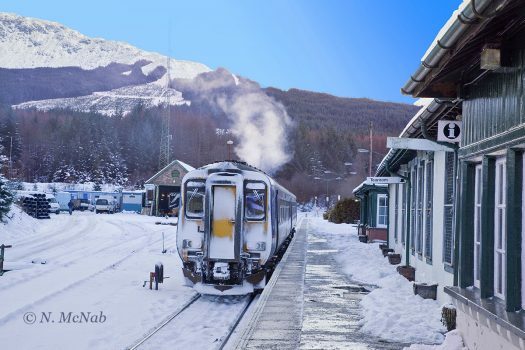 Crianlarich had two stations; Crianlarich Lower served, the now closed, Callander & Oban Railway which ran through Crianlarich, east to west and Crianlarich Upper for the West Highland Line which passes through Crianlarich south to north. Both stations were situated close to each other, with the West Highland Line crossing over the Oban Line. The two lines were interconnected but only for the purpose of freight movements. With both lines passing through Crianlarich, the village quickly assumed an importance in the mind of travellers and it has inherited a ‘romantic’ flavour as a result. Increased in more recent times by the growth of road borne tourists who are faced with signs as they travel from the south towards Glasgow, directing them to the A82 with the declaration: ‘ Crianlarich and the North‘ on the road network south of Glasgow. 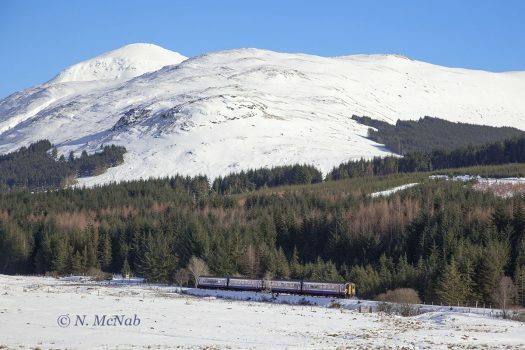 From this travellers can infer, correctly that Crianlarich, despite its name, is an important place and an ideal touring base whether by car, bus or train, albeit the most rewarding by far, to appreciate the scenery is the latter. Very recently the A82, which used to pass through Crianlarich and directly under the railway, has been diverted south, where it now joins the A85, west of the village. Mallaig/FortWilliam southbound crosses the A85 beside the junction with the A82. The station is located immediately beyond the end of the viaduct. 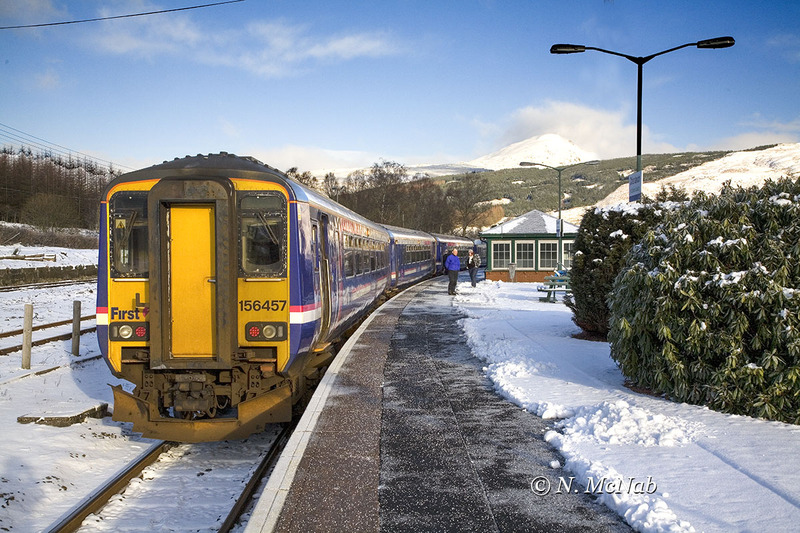 A Oban – Fort William and Mallaig service 1 mile south of Crianlarich. The two front carriages of the train will proceed to Oban after the train splits at Crianlarich. 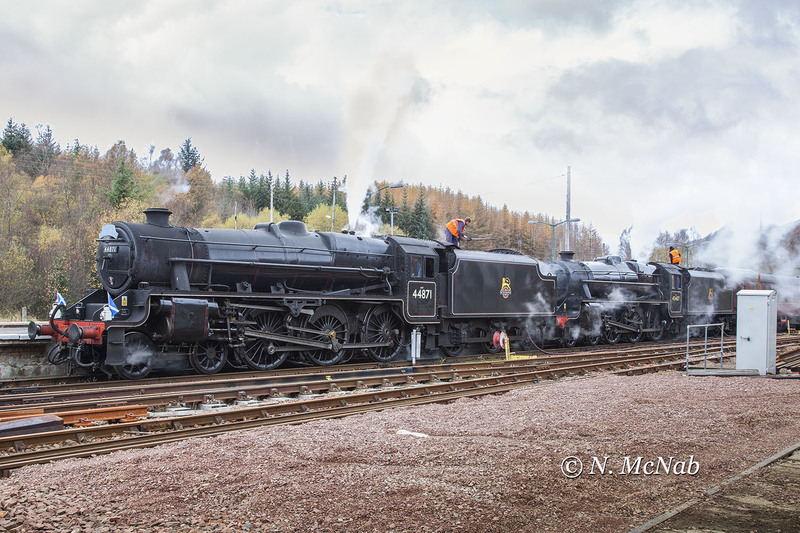 The rear pair will travel on north to Fort William & Mallaig. 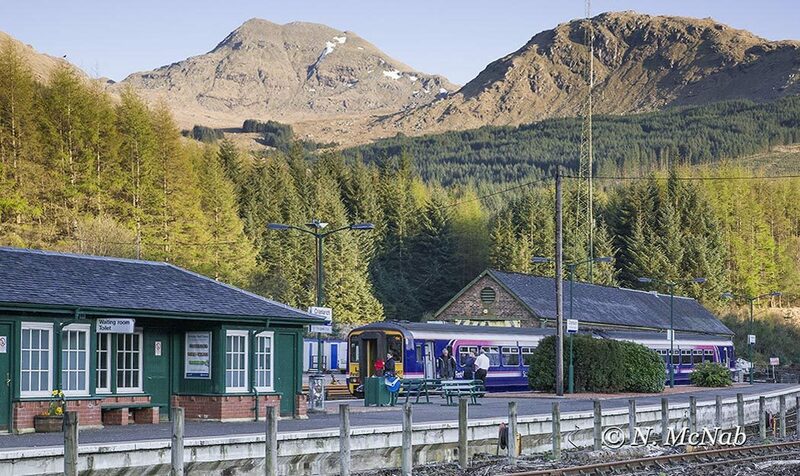 Crianlarich’s location is no less dramatic scenically, either, located beneath Ben More, which at just under 4,000ft, the highest mountain in Scotland, south of Strathtay, and next door to the Crianlarich ‘Munros’ – (The mountain behind the station in the picture at the top of the page is Cruach Ardrain – one of the Crianlarich group). The West Highland Way, walking route from Milngavie (north of Glasgow) to Fort William passes close to Crianlarich. 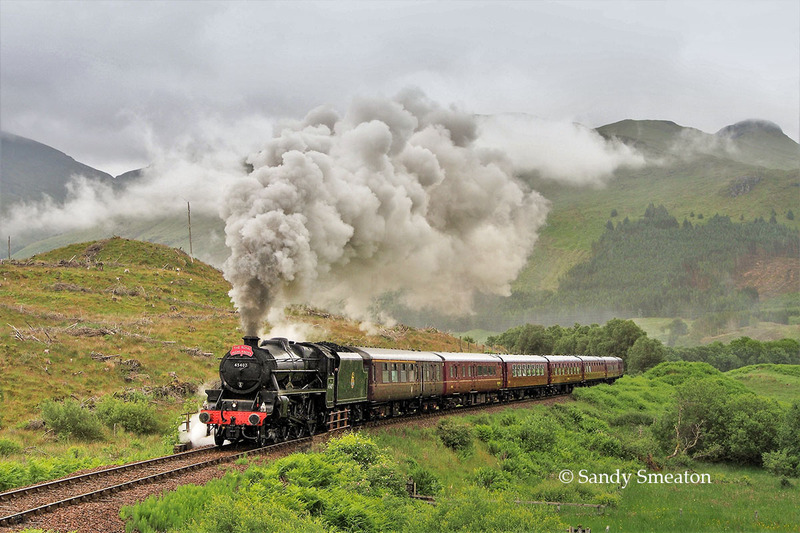 A Fort William/Mallaig train has left Crianlarich and is climbing towards Upper Tyndrum Station. 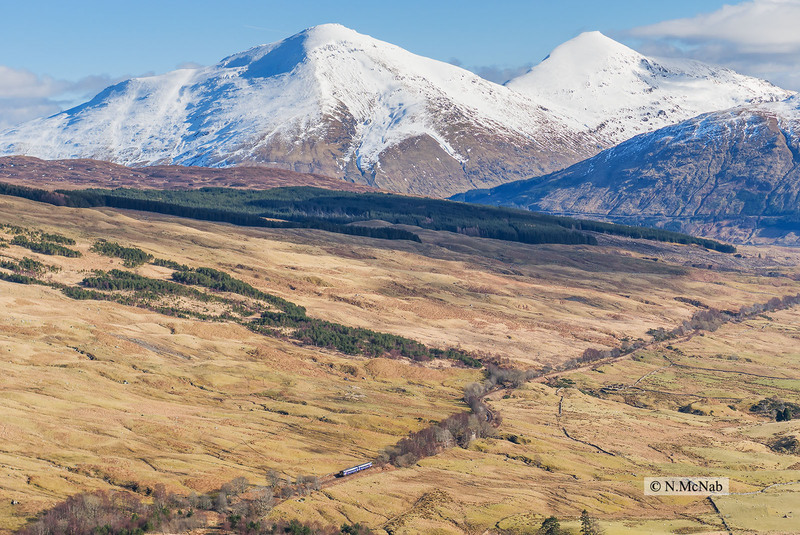 CLICK ON THE PICTURE to appreciate the scenic location with the twin peaks of Ben More and Stobinnein in the background. 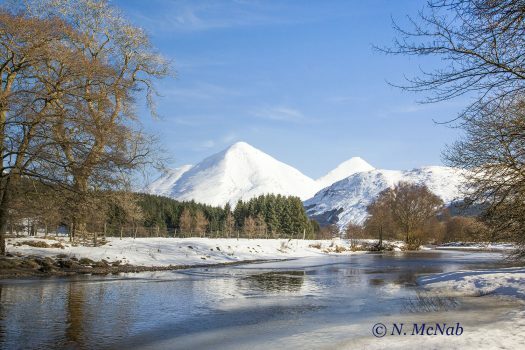 River Fillan with Ben More and Stob Binnein, Crianlarich. The Fillan is a part of Scotland’s longest river, The Tay. It starts as the River Connonish, with its beginnings in Ben Lui, becomes the Fillan, enters Loch Dochart to the east of Crianlarich and flows to Loch Tay at Killin and finally on to Perth and the Firth of Tay. 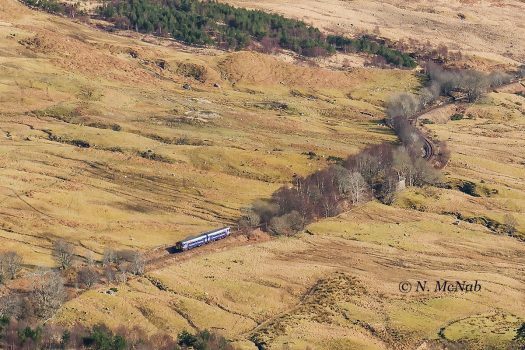 The Callander and Oban line section, east of Crianlarich via Glen Dochart and Strathyre, closed in 1965 (during the Beeching cuts) and there is now no Crianlarich Lower Station, furthermore Crianlarich Upper is now simply called Crianlarich. Trains to Oban share the West Highland Line from Glasgow as far as Crianlarich where they use the interconnection to branch from the West Highland Line back onto the original Caledonian Line to Oban. Indeed the majority of trains run combined from Glasgow to Crianlarich where they split. The front portion to Oban and the rear to Fort William and Mallaig. Fuller details about Crianlarich’s railway history and engineering associated with both railway lines can be read by clicking the Page Link above. February and the Oban – Fort William/Mallaig train waits to ‘split’ at Crianlarich. Beinn Challuim can be seen in distance. Early January and the Southbound train sits waiting on the Oban portion to arrive before proceeding south. Picture taken at 13.30, Temp. -8 C.
The station was laid out with a crossing loop around an island platform and sidings on both sides. On the east side were was an engine shed and a turntable. (The engine shed still exists and can be seen behind the train just entering the station). At the north end of the station, there was a junction with a link line to the Callander and Oban Railway. Originally, the junction incorporated a scissors crossover, allowing simultaneous moves through the junction. Black 5s 44871 & 45407 ‘The Lancashire Fusilier’ watering and preparing for journey south with SRPS Charter on 27th October 2012. 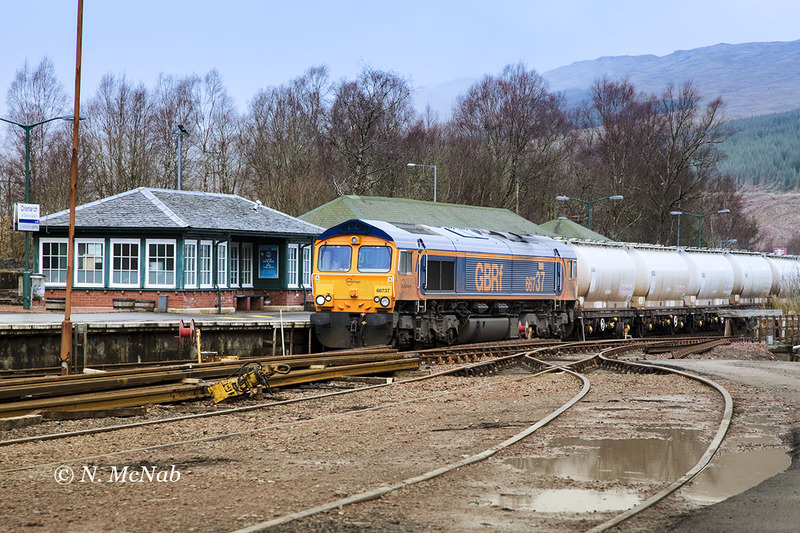 Class 66 with an alumina train destined for the smelter at Fort William.